The 2018 Winter Olympics in Pyeongchang began with a rare display of unity from South Korea and North Korea. 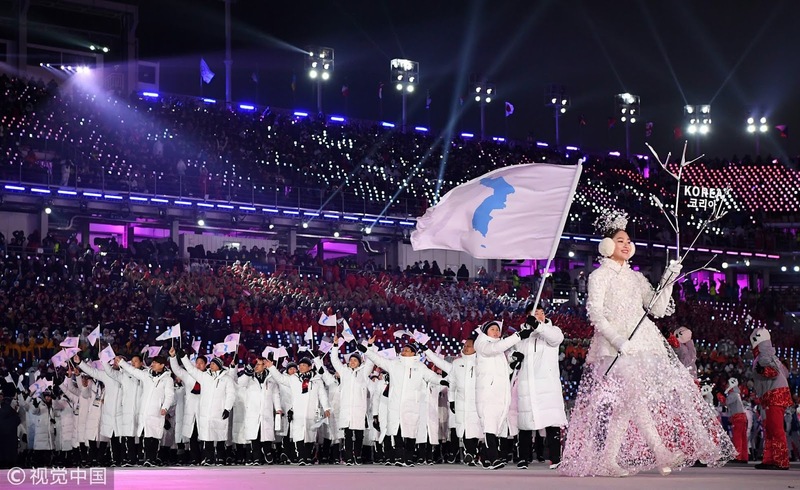 Olympic athletes from both nations marched together during the Opening Ceremony in South Korea. “United in our diversity, we are stronger than all the forces that want to divide us,” International Olympic Committee President Thomas Bach said Friday during the ceremony. The unified flag of Korea was jointly carried into Pyeongchang Stadium by South Korean bobsledder Won Yun-jong and North Korean ice hockey player Hwang Chung-gum. The united contingent of athletes was the last to walk in the parade of nations. Kim Jong Un, top leader of the Democratic People's Republic of Korea (DPRK), invited South Korean President Moon Jae-in to visit the DPRK at Moon's convenient time, the presidential Blue House said Saturday. Kim Eui-kyeom, spokesman for President Moon, told a televised press briefing that Kim Yo Jong, the younger sister of the DPRK leader, delivered a letter of Kim Jong Un to Moon showing Kim's willingness to improve inter-Korean relations. The younger Kim delivered the DPRK leader's message, saying the DPRK leader is willing to meet President Moon at an earliest possible date. The invitation was made during an informal meeting between Moon and the DPRK's Olympic delegation, including the younger Kim who serves as the first vice director of the Central Committee of the ruling Workers' Party of Korea. In response, Moon said, "Let's create conditions going forward and make it." The DPRK delegation was led by Kim Yong Nam, president of the Presidium of the Supreme People's Assembly. Two other senior delegates attending the meeting were Choe Hwi, chairman of the National Sports Guidance Committee, and Ri Son Gwon, chairman of the Committee for the Peaceful Reunification of the Fatherland. The meeting and luncheon, not disclosed to the media, lasted for about three hours at the presidential complex. It marked the first time in eight and a half years that a ranking DPRK delegation visited South Korea's presidential complex. In August 2009, the DPRK sent a high-ranking condolence delegation to bid farewell to late South Korean President Kim Dae-jung who held the first inter-Korean summit with late DPRK leader Kim Jong Il, father of the current leader. The meeting between President Moon and the DPRK delegates was held informally, not made open to the media. Attending the informal meeting from the South Korean side are the spy agency chief, the unification minister, the presidential chief of staff and the top presidential security advisor.